Red Sea Coral Coloration Program – Spice up your colors. Red Sea’s research has identified 31 minor and trace elements that in addition to the foundation elements are present in the skeleton and soft tissue of all corals. The Red Sea Coral Coloration Program’s supplements family divides these elements into four groups : Coral Colors A, B, C and D that are related by the biological functions they perform. They are also associated with the production of specific color pigments in the soft tissue of stony corals. These pigments can only be produced if the specific elements required for the bio-chemical process are available in the correct concentration. All 31 elements are required by all stony corals irrespective of the actual color the coral displays. Red Seas’ Coral Color supplements have been formulated such that the ratio of the elements in each supplement is the same as that found in the skeleton and soft tissue of corals. Our research has identified a constant ratio between each of the Coral Colors and the overall consumption of calcium, which is proportional to coral growth and metabolic activity. This provides an easy and safe method of dosing all Coral Colors Supplements based on a measured calcium uptake. 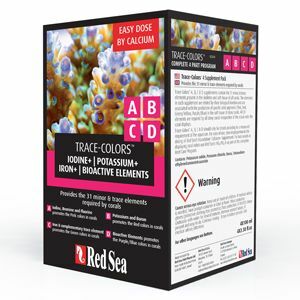 Coral Colors A, B and C each contain a leading element (iodine, potassium and iron) that is accurately measurable with Red Sea’s unique Coral Colors Pro Test Kits. For more advanced LPS and SPS aquariums Coral Colors A, B and C can therefore be dosed precisely according to the total demand of the reef for these elements.